A Free Jar of Avocado Oil Mayo, Just for You! Most conventional mayos are made from unhealthy canola and soybean oils, added sugars, and preservatives to “improve taste.” Primal Kitchen Mayonnaise, on the other hand, is made from avocado oil—a heart-healthy oil that is about 70 percent monounsaturated fats. These “good fats” help the body regulate cholesterol levels, as well as increase the absorption of antioxidants and other nutrients. That’s why Primal Mayo is the holy grail of condiments—every dollop of this mayo is so good for you that you can use it lavishly to upgrade the flavor (and nutrition!) of your meal. Plus, this avocado oil mayonnaise is incredibly versatile. It’s absolutely delicious in everything from homemade ranch or ceasar dressing, to tuna or chicken salads, to fresh dips and sauces. And my favorite egg salad! Not an avocado oil convert yet? Well, you’re in luck, because Thrive Market is offering all first-time members a FREE jar of Primal Kitchen’s Paleo-friendly avocado oil mayonnaise! All you have to do is pay the $1.95 shipping fee. Claim your free gift today before they’re gone! This offer applies to new members only, but existing members can also get a free jar when they make a purchase of $50 or more on Thrive! This offer will expire Thursday, 5/19, at 11:59 p.m. PST. 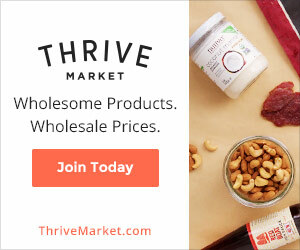 Full Disclosure: I am an affiliate of Thrive Market! Sign up now to get your free copy and weekly nutrition tips right in your inbox!